NO SET-UP CHARGES! 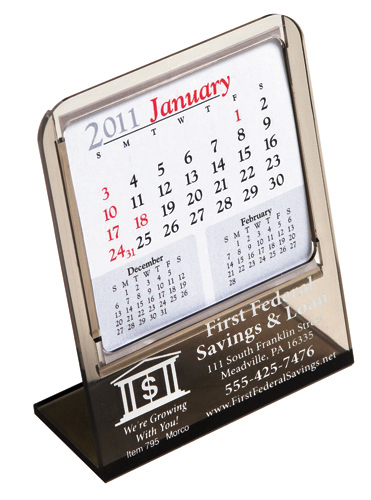 The Pike Desk Calendar features a foil-stamped imprint with a 4 3/8" x 3 1/4" 13 month Memo style date pad. Available in gold or black with gold or black foil-stamped imprint. See "Options" for other than standard color imprint. 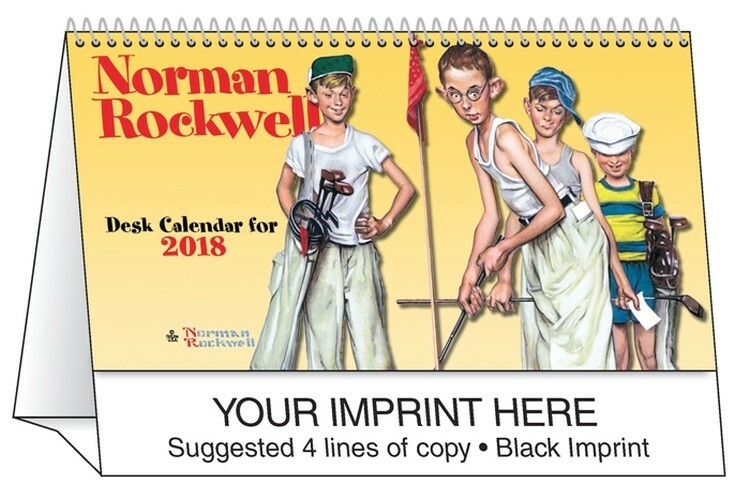 Free mailing envelopes are included, calendars not inserted. NO SET-UP CHARGES! 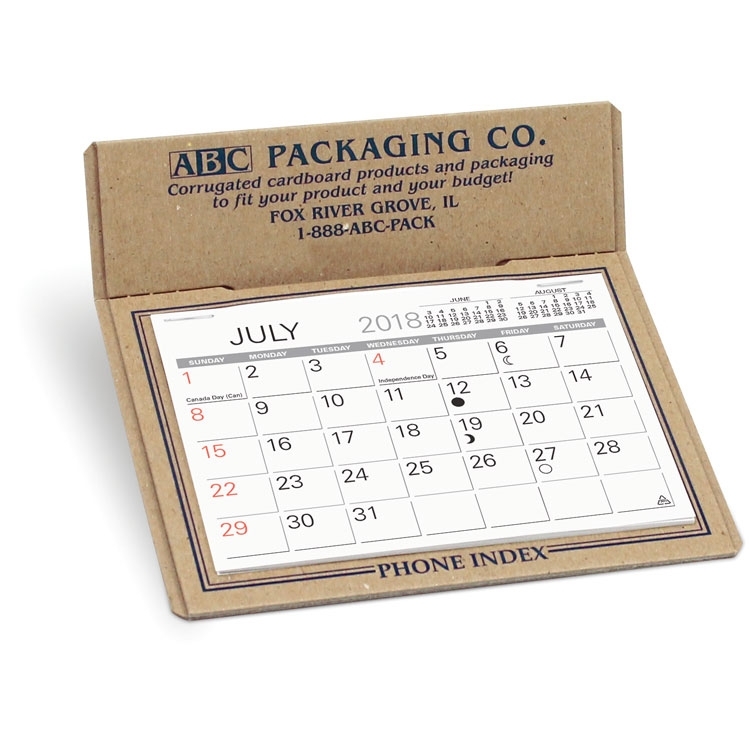 The Eco Friendly Forest Desk Calendar is made from raw chipboard and offers a foil-stamped imprint and a 4 3/8” x 3 1/4” memo style 13 month date pad with full year calendar printed on the back. Standard in natural chipboard color with green, red, maroon or blue imprint. See "Options" for other than standard imprint colors. Free mailing envelopes are included, not inserted. Desk calendar with 3 month at a glance calendar pad. NO SET-UP CHARGES! 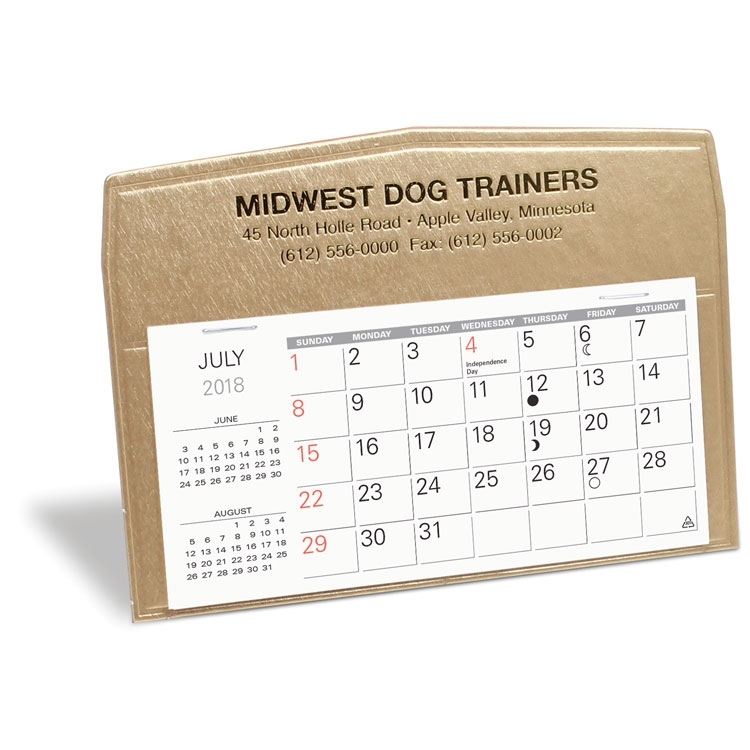 The Cartwright Desk Calendar offers a foil stamped imprint, and a 5 3/8” x 2 5/8” medium memo 13 month datepad. Standard in white, maroon, navy or gold all with a gold imprint. See "Options" for other than standard imprint colors. Free mailing envelopes are included, not inserted. 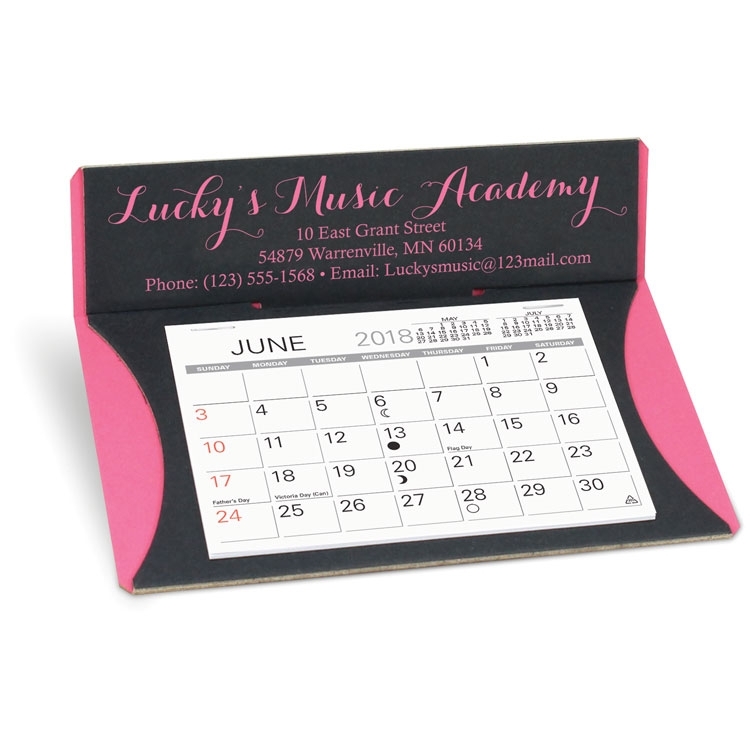 The Mailer is our low cost, lightweight, mail friendly calendar with 5 3/8" x 2 5/8" memo style pad. Mailing envelopes are included. Not inserted. 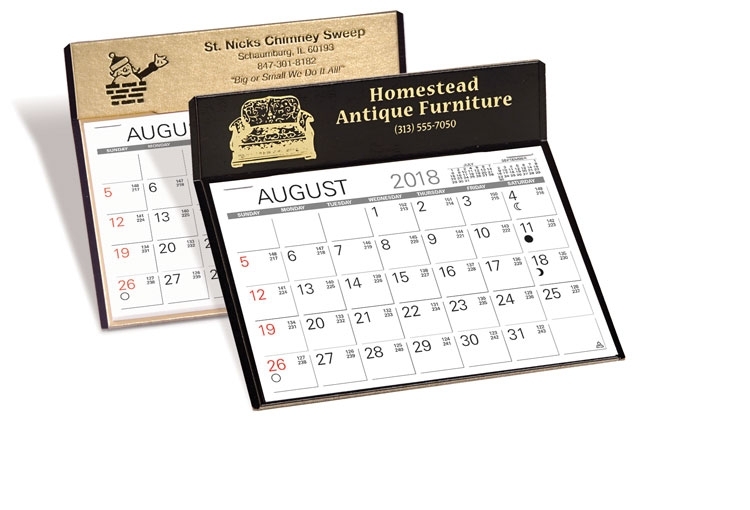 The Monterey monthly desk calendar with choice of Scenic, Memo or Historical 4 3/8" x 3 1/4" monthly date pad. If not specified Scenic is standard. Mailing envelopes are included. Not inserted. 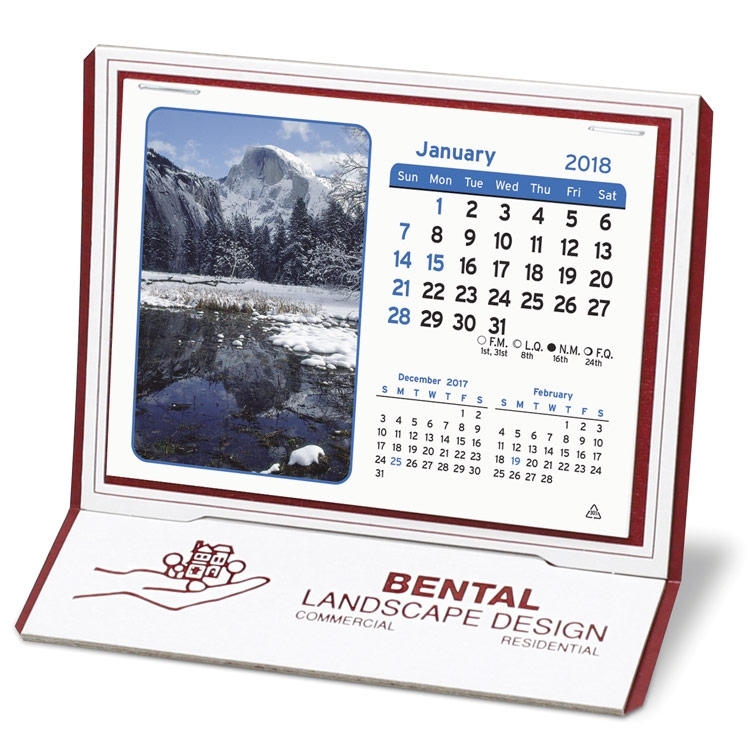 Desk calendar with a scenic image for every month. Every month features a scenic image and calendar pad while the opposite side has a handy three month-at-a-glance calendar for effective planning. 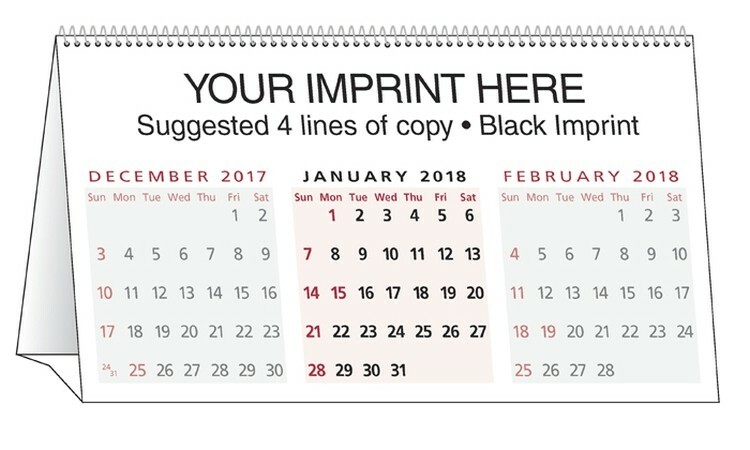 Your logo is featured on each side of the calendar for double the exposure! Features a spiral white wire. Free full-color imprint included in 24 locations! NO SET-UP CHARGES! 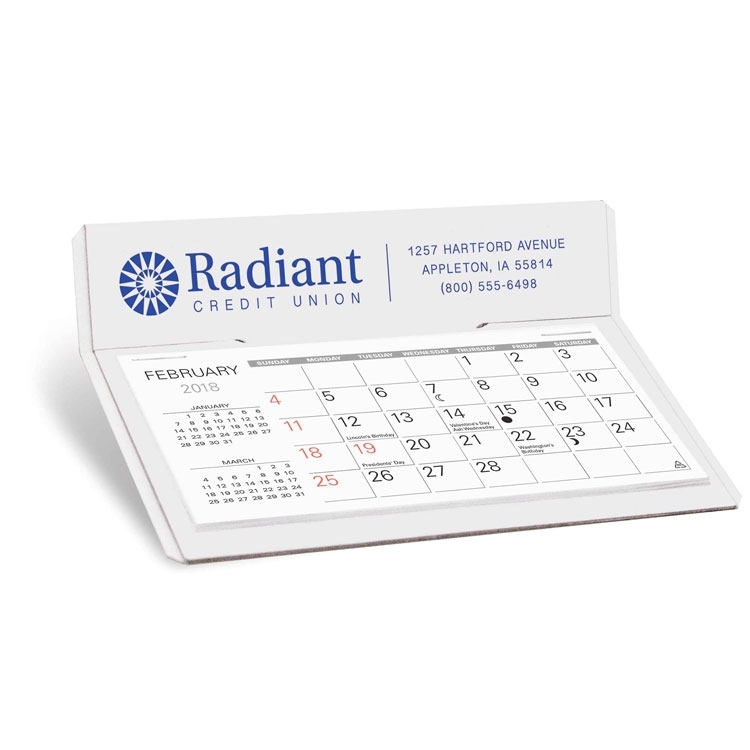 The Crescent Desk Calendar offers a unique trim style, a foil-stamped imprint and a 4 3/8” x 3 1/4” memo style 13 month date pad. Standard in black with Caribbean Blue, Flamingo Pink, Orchid Purple, Key Lime or Sunshine Yellow trim and all with a matching imprint color or gold or silver imprint. See "Options" for other than standard imprint colors. Free mailing envelopes are included, not inserted.